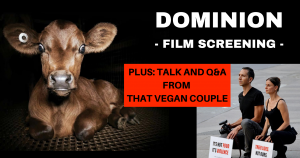 Exposing the dark underbelly of modern animal agriculture through drones, hidden and handheld cameras, the feature length film explores the morality and validity of our dominion over the animals. Natasha and Luca from Australia are That Vegan Couple on YouTube and other social media (thatvegancouple.com). In 2019 they’re on their It’s The Least We Can Do activism tour. Presented by Vegan Activists of Alberta and featuring That Vegan Couple. Intimate Q & A discussion immediately following the film.